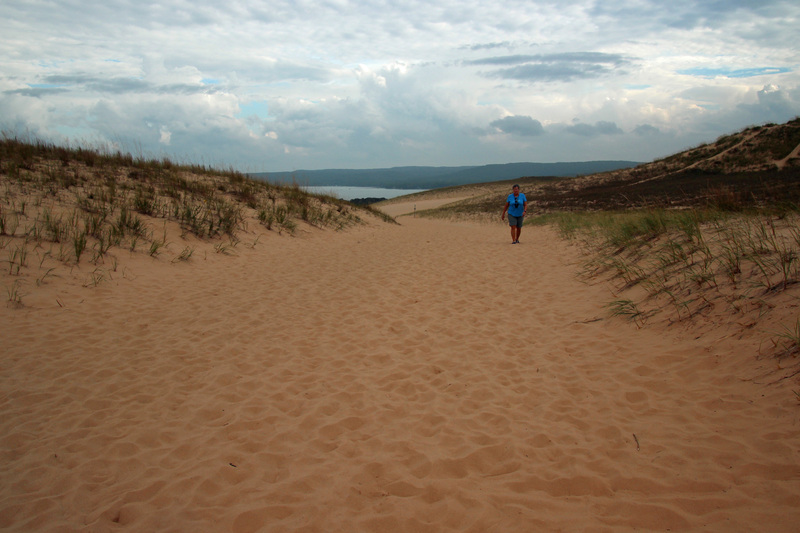 Sleeping Bear Dunes is pretty amazing. 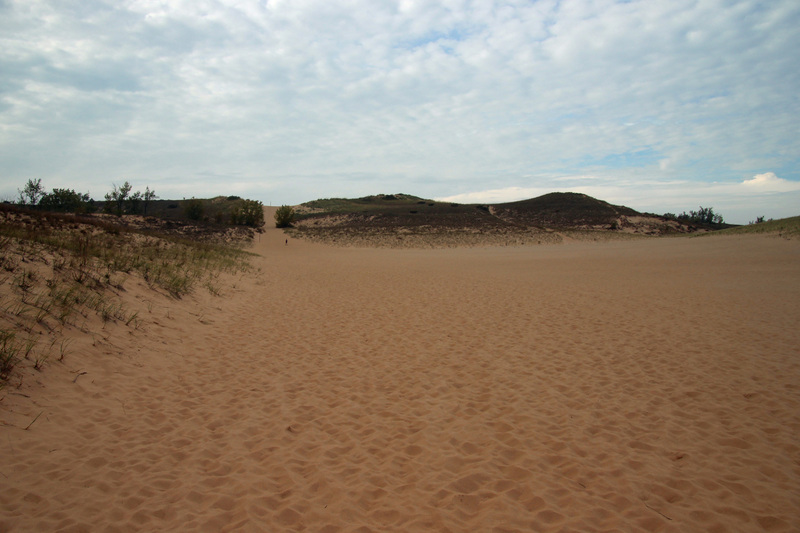 Once we made camp in a nicely wooded spot (meaning acorns hit the roof regularly), we had time to unhitch the car and drive to spots along Lake Michigan (this was a back-in site anyway). 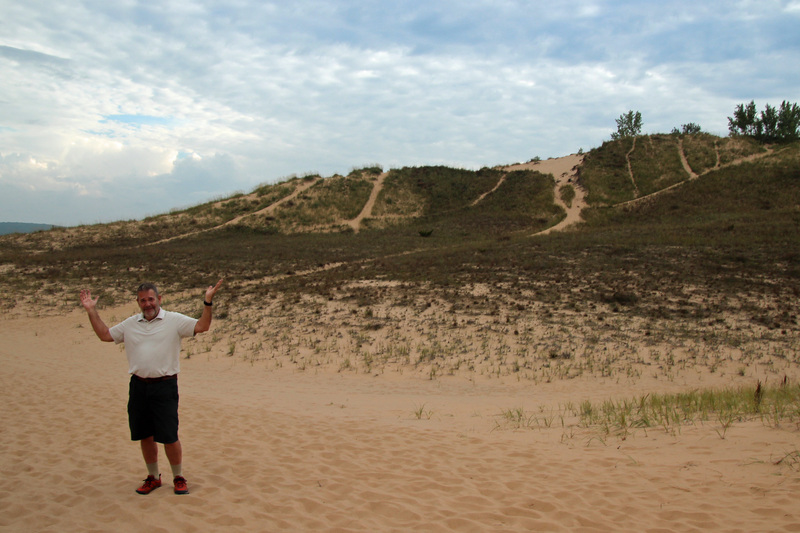 The first stop was the Dune Climb. From the parking lot it didn’t look too bad, just a big pile of sand in front of us, so up we went. Yep, just like walking in soft sand at the beach, except not carrying the chairs, umbrella, towels, etc. Well, puff puff, maybe a steep beach. Ok then, we made it to the crest … oh but not really. It flattened out a bit and we reached the one mile marker. But it continued onward and upward. 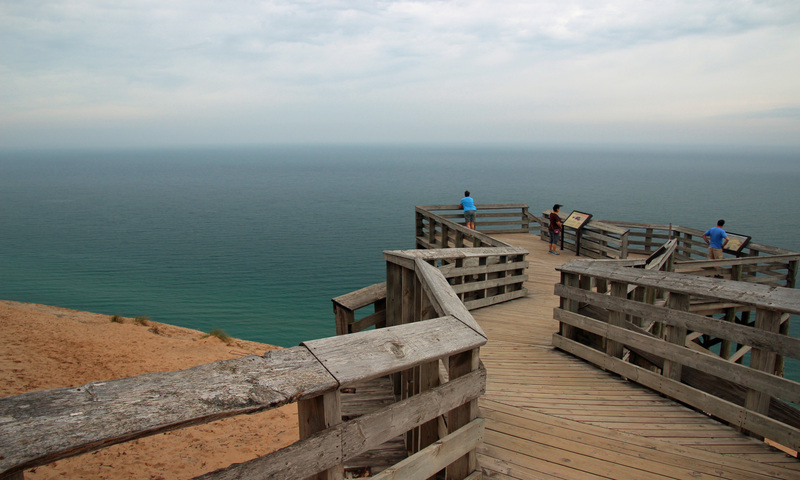 We asked another couple coming back down if the next crest gave you a view of Lake Michigan, and they said “no, just the next hill.” Ok, that was enough. Back down we went. Good thing, cause my toes were cramping in my shoes from all the added sand. It was very fine and had this nasty habit of filling your shoes and socks. Back in the car we drove on another scenic drive that had some overlooks of the dunes area and then we found the best overlook for the lake. 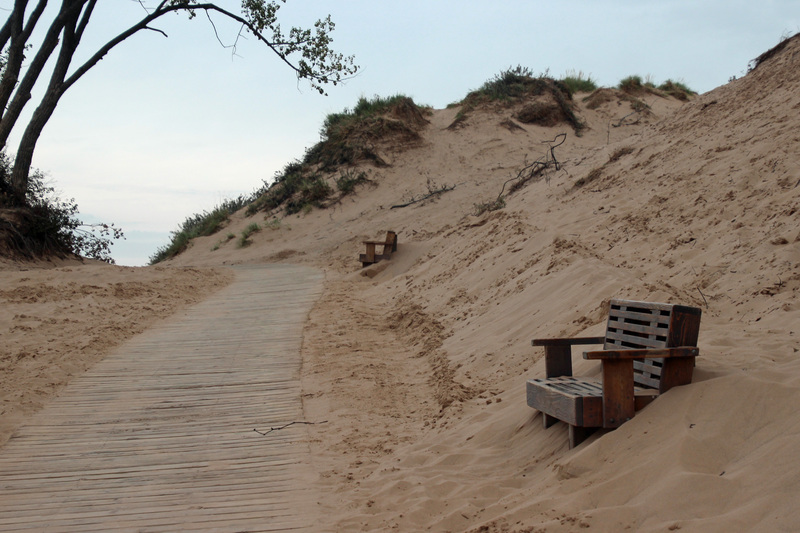 Lots of sand and a pretty steep slope down to the shoreline. 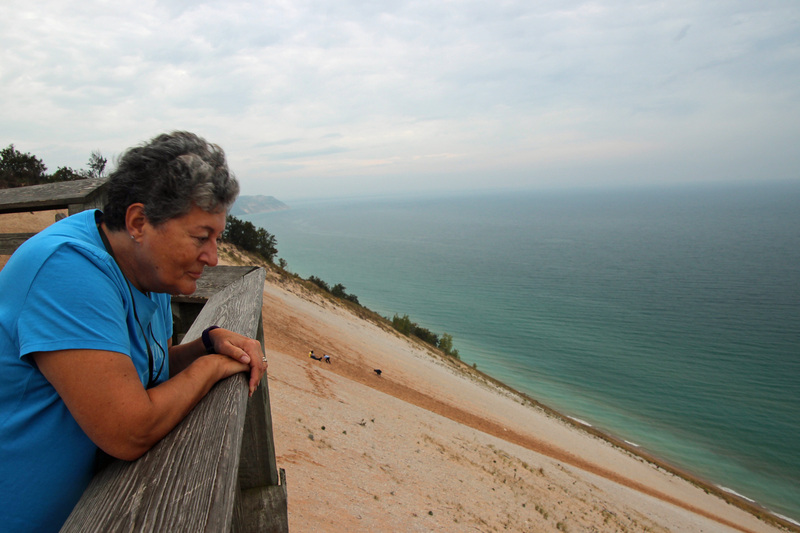 You got a great view of the lake and dune from the overlook, but some folks insist on sliding down the sand and then trekking back up the steep slope, despite warning signs. It would have been nicer if it was not overcast and windy, but it was still a wild view. Overnight it rained again and in the morning we drove around the corner to hitch up the car in the picnic area along the Platte River. 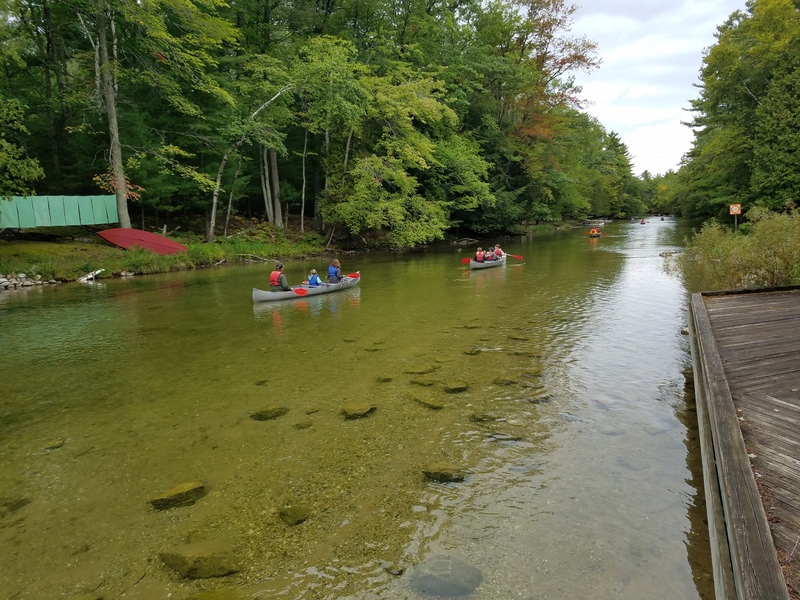 Once connected, we walked to the river’s edge to watch some morning canoeists heading downstream. 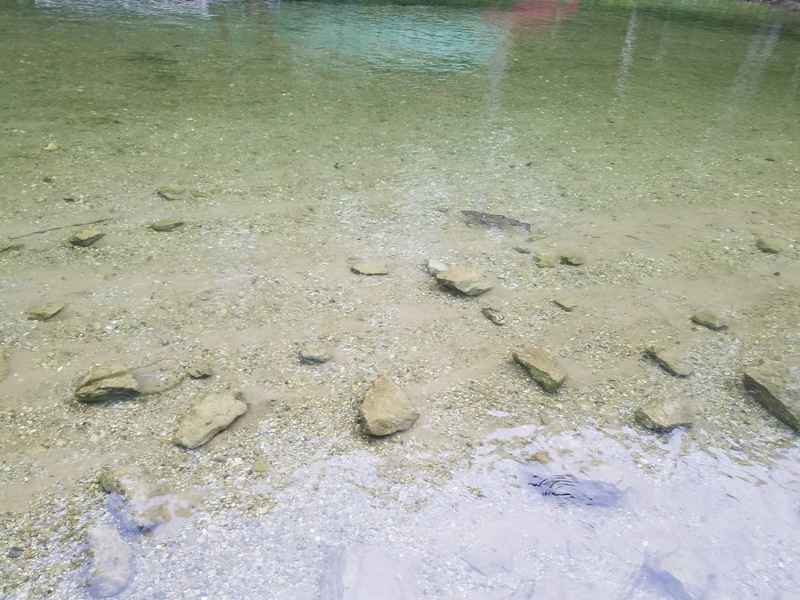 The water was clear enough to watch some of the salmon heading upstream to spawn. How cool. The drive east took us through Traverse City (darn, too early to sample breweries) along the lake. One block back from the waterfront is a river that runs through town like a canal, filled with powerboats and waterfront homes. That seemed really cool for the summer. We headed northeast toward 1-75, across farmland, and I asked Jackie to scout out a place for lunch. 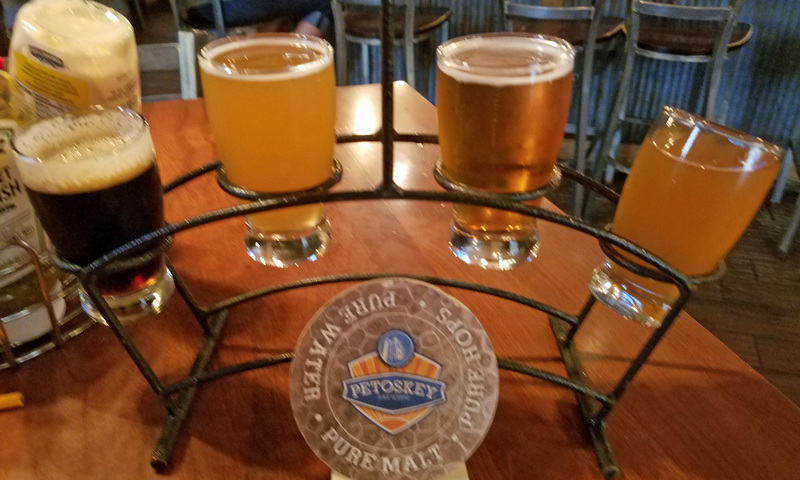 She found Petoskey Brewing along our route. They had ample parking for the motorhome, so naturally that meant we were in for lunch and a flight. What a great choice it turned out to be! Jackie ordered a Reuben sandwich and I chose a black and blue bacon burger, both with beer batter fries. Totally delicious food. And our flights (one each this time) were some of the best beers so far. Two favorites for me were Beach Slapped (pineapple, coconut blonde ale – awesome flavor) and grapefruit shandy. Jackie thought the brown ale was the best. Good pit stop. As we continued north, the day changed from drizzle to sunny/partly cloudy, but the temperature dropped into the mid 50’s. What a nice change. Pretty soon we could see the Mackinaw Bridge ahead of us and we were driving up and over the connection between Lake Michigan and Lake Huron. Cross winds were strong, so we kept it at 25 mph. 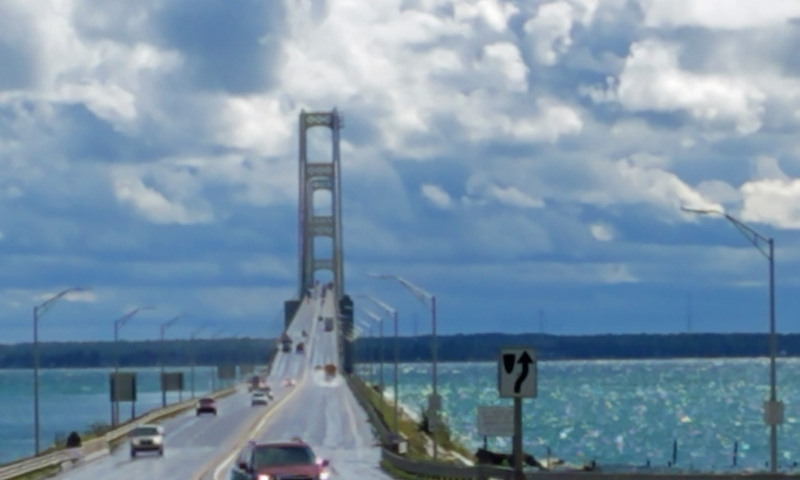 Crossing into the Upper Peninsula of Michigan and the rain started up again. 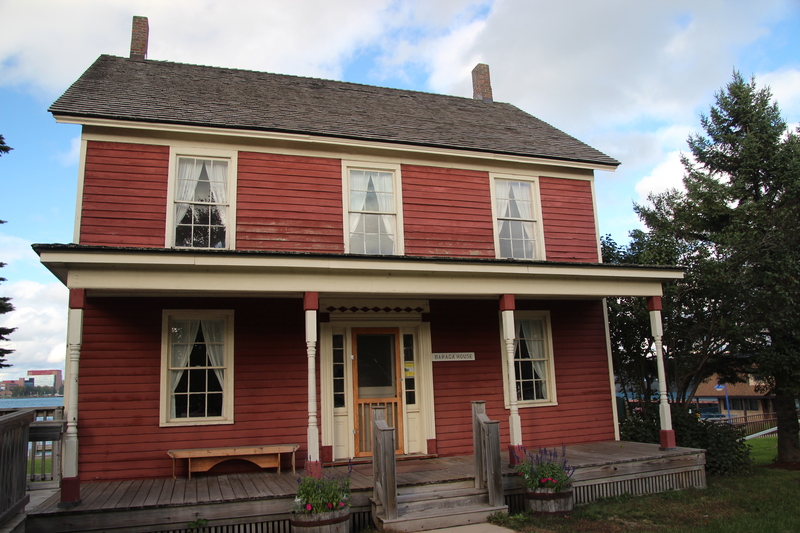 However the scenery of farmland, barns, wineries and orchards continued until we reached Sault Ste. Marie and the Soo Locks. 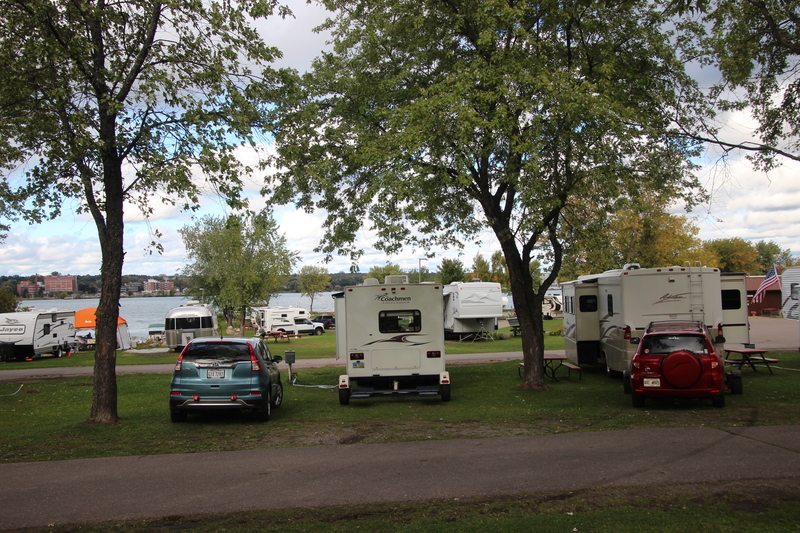 Our campground was just along the waterway, where we could watch the tankers moving to and from the locks. 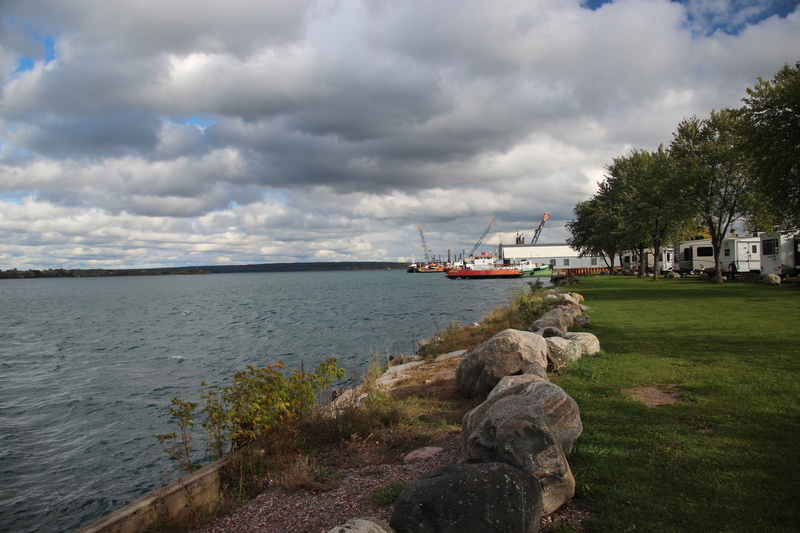 Actually, the waterway is a rapids downhill between Lake Superior and Lake Huron with several locks for boat traffic. 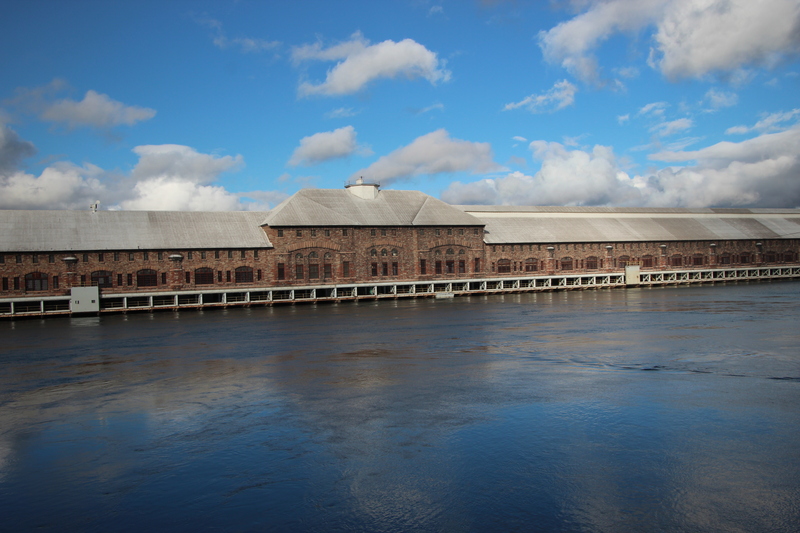 A large canal runs through town and joins Lake Huron through a hydroelectric power plant. 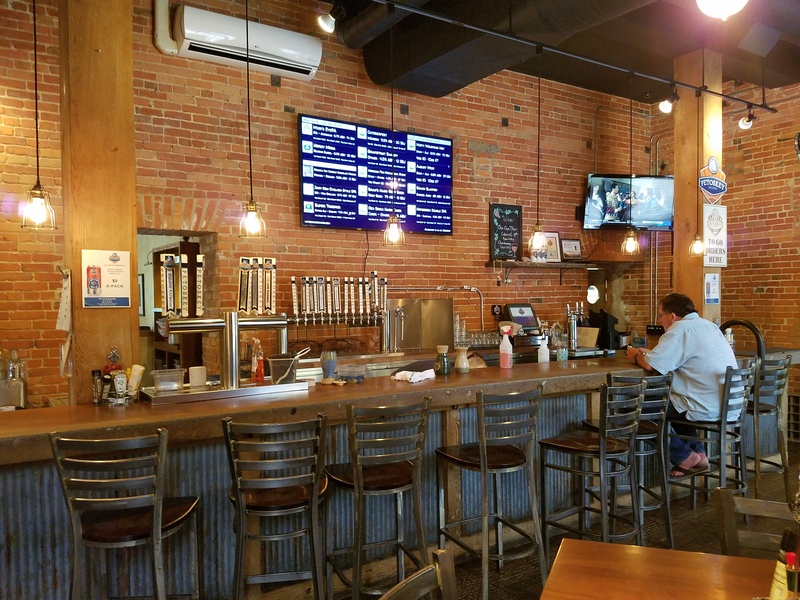 Since there were supposed to be two breweries in town and we didn’t want to disconnect the car, I decided to walk the 2 miles or so to town after dinner to check them out. 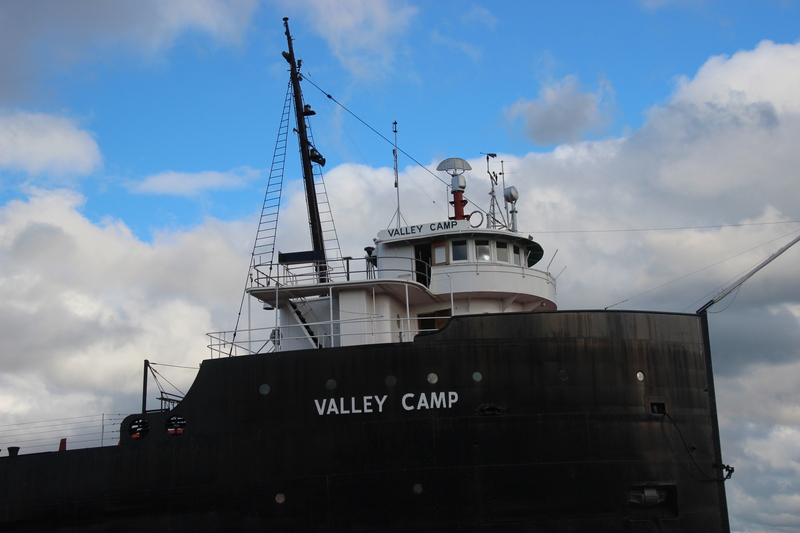 It was a straight shot to downtown that crossed over the canal at the power plant, but otherwise a pretty grassy wharf area. Kinda chilly, so I had a jacket over my hoodie and long pants on. 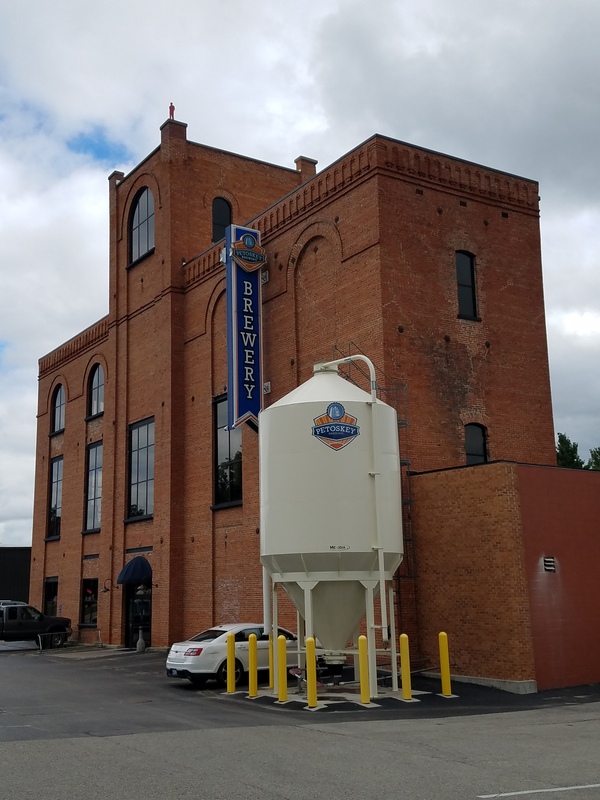 First stop was Soo Brewing – located in a storefront, tanks and all. They only had three beers on tap, so I had their summer wheat. Not bad, but not a particularly “mature” brew. 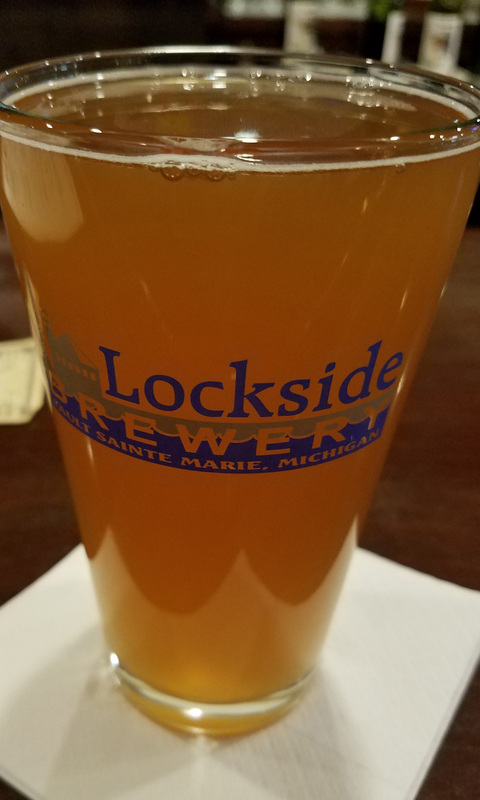 Next stop was Lockside Brewing and Winery, which was really more restaurant and bar, with only 2 beers on tap and no brewing tanks that I could see. Their Goldilocks blonde was a clever name, but nothing special. Time to head back to camp. About the time I reached the halfway point over the canal I noticed a large cat running across the road in the streetlight. Out for a prowl no doubt and headed for the grassy areas. Further along, I looked left to see the same animal running my direction under the lights. That was no cat – it was a fox. Around the next building I hustled to catch up, then waited, but it started to drizzle. As I turned away, I saw the fox headed back, bushy tail straight out and trotting along. What a cool sight. Ah, but the drizzle became real rain and I had to trot my way back to camp before I got soaked. But it was worth it. In the morning we plan to head out early, what with the crossing into Canada and a long stretch of driving ahead of us. Still a bit leery of what the crossing will be like, but we have all the paperwork and not much alcohol to declare. Next stop, Canada. Thanks for following us on our journey to the fall colors of New England.